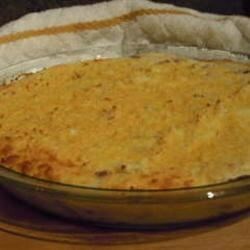 "This casserole is quick and easy to make. I use this recipe for all large gatherings and it is enjoyed by everyone. It uses powdered instant potatoes, sour cream, cheddar cheese, and bacon bits. The potatoes can be bought at any wholesale store." Add sour cream and bacon bits; mix well. Place in a 9x13 inch baking dish and top with cheese; bake for 30 minutes or until cheese is melted. A wonderful recipe! The only thing that I did different was stirred half of the cheese into the potatoes and put the other half on top. It added some cheesy flavor throughout. this was good, turned out a little dry for me so I'll use more sour cream next time! I left out the bacon in this recipe but otherwise I followed it exactly. My family really liked it. My husband said it tastes like the inside of twice baked potatoes. Really good. These potatoes are so yummy and so easy to make!!! My dad said I could start a restaurant with these!! I will be making these again and again!! Great for kids, not so great for adults..overall, a great, quick, kid option. I substitute ricotta cheese for sour cream and use fresh bacon. If you want to spice it up a bit, use pepper jack in place of cheddar. Add some finely chopped chives and you're set! This easy recipe got rave reviews from all my friends at a social function. They ranted and raved and I pretended like I worked so hard on it! I love this dish- delicious and so easy!